Childbirth is a quintessential family event that simultaneously holds great promise and runs the risk of danger. By the late nineteenth century, the birthing room had become a place where the goals of the new scientific professional could be demonstrated, but where traditional female knowledge was in conflict with the new ways. Here the choice of attendants and their practices defined gender, ethnicity, class, and the role of the professional. Using the methodology of social science theory, particularly quantitative statistical analysis and historical demography, Charlotte Borst examines the effect of gender, culture, and class on the transition to physician-attended childbirth. 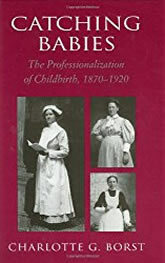 Earlier studies have focused on physician opposition to midwifery, devoting little attention to the training for and actual practice of midwifery. As a result, until now we knew little about the actual conditions of the midwife’s education and practice. Catching Babies is the first study to examine the move to physician-attended birth within the context of a particular community. It focuses on four representative counties in Wisconsin to study both midwives and physicians within the context of their community. Borst finds that midwives were not pushed out of practice by elitist or misogynist obstetricians. Instead, their traditional, artisanal skills ceased to be valued by a society that had come to embrace the model of disinterested, professional science. The community that had previously hired midwives turned to physicians who shared ethnic and cultural values with the very midwives they replaced.